A delegation of local and regional governments will attend the 5th High-level Political Forum on Sustainable Development (HLPF) from 10-19 July, 2017, where they will present a report on the role of local and regional governments in implementing and monitoring the SDGs. The HLPF is the central UN platform for the follow-up and review of the 2030 Agenda, and is therefore a vital space for local and regional governments to underline the role of strong local leadership and commitment in the achievement of the SDGs. 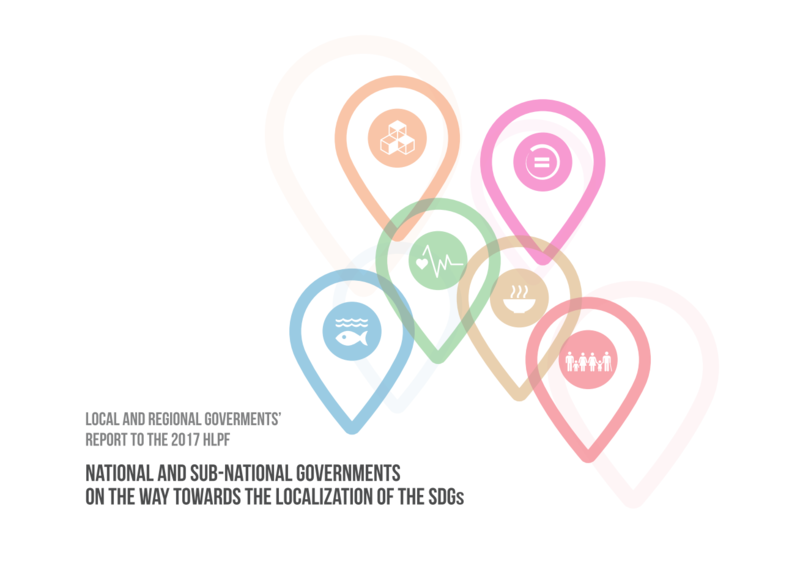 On 11 July, the Global Taskforce will present a report to the HLPF entitled “National and sub-national governments on the way towards localization”, contributed by UCLG. The report provides evidence of the current and potential role of local and regional governments in the implementation and monitoring of the SDGs. It is based on first-hand information collected by networks of local and regional governments in over 30 countries, complemented by an analysis of the 63 official National Voluntary Reviews (NVRs) and ‘Main Messages’ presented so far by national governments. The publication shows that, in a majority of the countries that have reported to the HLPF, local and regional governments are in charge of key policy areas relating to the achievement of SDGs 1, 2, 3, 5, 9 and 14. It also showcases how subnational governments are taking action to localize the SDGs by means of multidimensional, territorialized and pro-poor policies. The report provides evidence of successful localization practices at national level, and argues that decentralization and financing reforms are necessary in many countries to create an enabling environment for local and regional governments. The report argues that the lack of space to report from a local perspective at the HLPF risks missing an opportunity to harness the potential of local and regional governments to achieve the SDGs. It points out that local and regional governments have participated in 57% of VNRs in this HLPF cycle, and calls for stronger efforts to involve the constituency in the VNR process and in new institutional frameworks for SDG implementation and follow-up. On 12 July, UCLG, the Global Taskforce, and the Permanent mission of the Netherlands to the UN are co-organizing a HLPF side-event entitled “Localizing the SDGs: local and regional government actions for poverty eradication and prosperity”. The event will bring together representatives from LRGs, national LRG associations, civil society and UN agencies to debate the role of local and regional governments in the SDG implementation process. On 13 July, the Governments of Flanders, Catalonia, and nrg4SD (organizing partner of the Local Authorities Major Group) are organizing a parallel event during the first week of the High Level Political Forum for Sustainable Development. The event will focus on implementation of the SDGs by regional governments, and especially their involvement and inclusion in national processes, and the creation of regional governments own plans and strategies in others. The event will also see the presentation of the results of a survey of regional governments carried out by nrg4SD in several VNR countries. Based on those, a report of this consultation will be presented during the side-event and, as an outcome, a series of recommendations on how VNR countries could include and collaborate with subnational governments will be shared. The 13 July will also see a side event co-organised by Ford Foundation, Cities Alliance, World Resources Institute, UN Foundation and Children and Youth International. The event will see a debate on how an urban perspective can contribute to interconnected approaches to address poverty, hunger, health and well-being, gender equality, resilient infrastructure and innovation. The Mayor of Ultrecht and President of VNG, Jan Van Zanen, will participate on behalf of the Global Taskforce. From 17-18 July, Deputy Secretary General, Dr. David Navarro, has convened a special two-day meeting on the Local 2030 Hub. ​The Local 2030 Hub, an initiative launched in early 2017 by the UN General Secretary Office, aims to create a working platform on the localization of the SDGs, bringing together the main UN Agencies collaborating with the Global Taskforce. The Global Taskforce will contribute with a session on Capacity Building for Localization. Website facilitated by United Cities and Local Governments.